Visit three or four rooftop bars in one afternoon. Open year round with heated rooftop areas! 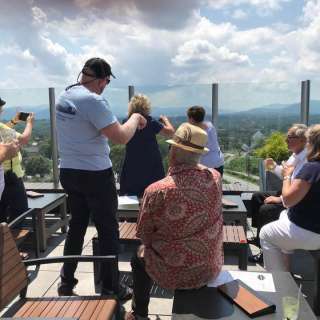 Asheville Rooftop Bar Tours offers a one of a kind blend of city history, sightseeing, and award winning rooftop bars included in the mix. See historical photos of the city from the late 1800's & early 1900's for an Asheville then and now perspective.. A short history followed by time to enjoy hand crafted cocktails, craft beers, extensive wine lists, scrumptious lite fare from the city's best chefs. Tours are 2.5-3.0 hrs or 3.5-4 hrs long & are 7 days a week. Must be 21 yrs old and up. One of the best parts: a driver! Group tours available.